The XProject plugin for oXygen can be found here (downoad the latest file named xproject-oxygen-plugin-*.zip). Unzip the archive in your oXygen install directory, in its subdir plugins. This must result in a subdir [oxygen]/plugins/xproject/. For instance on Mac OS X, this will typically result in creating the new directory /Applications/oxygen-13.2/plugins/xproject/. The next time you start oXygen, you will have 4 more buttons in the toolbar, named Build, Test, Doc and Release. While editing any file within your project directory, you can click one of those buttons to execute the corresponding XProject target. Build creates a new package in dist/ based on src/. Test run the XSpec tests in test/ and place the reports in the same dir (see the sample project in the ZIP to see how to configure your processors and XML databases to run the tests), Doc places the XQuery documentation in dist/xqdoc/, and Release creates a new delivery file in dist/. The packages created by Build can be installed automatically in any EXPath Packaging System-compliant system. Any feedback, help, request for improvement is welcome! Please use the EXPath mailing list. The sources can be found on GitHub. See the dedicated oXygen page, it contains an addon site descriptor, understood natively by oXygen. The first button creates a new project and the 4 following buttons act on an existing project. In order to identify an existing project, those buttons look at the file open in the current editor window, and select the project it is part of (that is, its ancestor directory containing a project descriptor xproject/project.xml). Display a file selection dialog box. The user has to type the name of a new directory. The plugin will create this new directory, as well as two sub-directories (resp. src/ and xproject/) and the project descriptor. If everything goes well, it opens the new project descriptor in the editor. The user can then edit it as any other XML file, in order to give the project a name, a version number, etcetera. Create the package for the current project (the package is a XAR file, or a XAW file if the current project is a webapp project). The archive is created in the sub-directory dist/. Test the current project. That is, execute the XSpec test suites located in the sub-directory test/, and generate HTML reports for them. See the main XProject documentation to learn how to configure test suites to be run by different and/or several processors and databases. 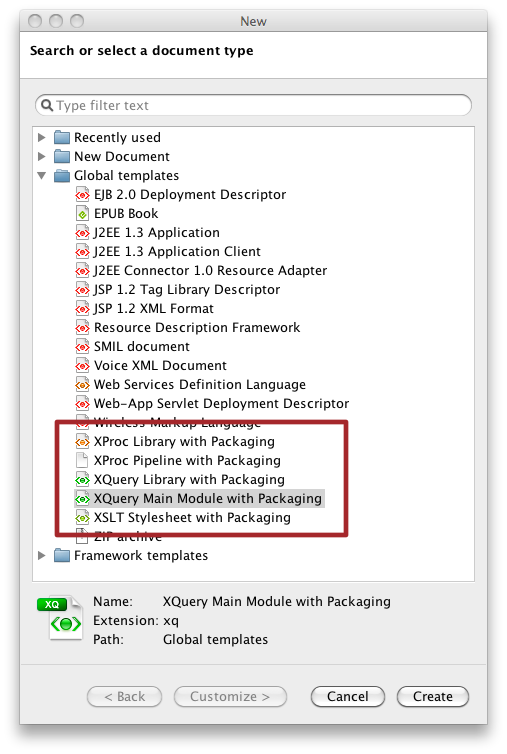 Generate the documentation for the project, based on xqDoc, xquerydoc, XSLStyle and/or oXygen's XSLT documentation vocabulary (only XQuery documentation is support right now). Build a ZIP file suitable for delivering the project to end users. The ZIP file contains the package itself (the XAR or XAW file), the project sources, the documentation, a VERSION file, etcetera. The new created file contains the declaration for the XProject namespace when applicable, and clearly identified places to adapt to your own code (e.g. the public import URI you want to affect to the new component). Just replace what is specific to your new file and you are ready to develop your component. It will be automatically added to the package the next time you build the project, with the correct import URI!